The Varioderm™ range, manufactured in Germany by Adoderm GmbH and distributed in the UK by Adare Aesthetics, was launched in the UK in April 2008 by Medical Aesthetics Group. You may only come across a few practitioners using this product. It consists of a range of very highly cross-linked, pure non-animal hyaluronic acid fillers available in 4 concentrations. 6mg/ml of hyaluronic acid for the treatment of superficial lines and wrinkles such as forehead lines, periorbital lines (crow’s feet) and perioral lines (lines around the mouth and lip area). 2 x 1ml syringes with a 30 gauge needle. 12mg/ml of hyaluronic acid for the treatment of medium to deep wrinkles such as forehead lines, frown lines, nasolabial folds (nose-to-mouth lines), and the contouring of the lips. 2 x 1ml syringes with a 29 gauge needle. 18mg/ml of hyaluronic acid for facial contouring such as augmenting the cheeks and chin areas, and for deep wrinkles such as nasolabial folds. 2 x 1ml syringes with a 27 gauge needle. 27mg/ml of hyaluronic acid for contour correction and volume replacement of the cheeks, chin and nasolabial areas. 2 x 1ml syringes with a 26 gauge needle. Individuals with a known hypersensitivity to hyaluronic acid or an auto-immune disease. Varioderm™ should not be injected into inflamed or infected skin, such as active acne, herpes (cold sores) etc., or those with a tendency to develop hypertrophic (red and raised) scars. It should not be used in conjunction with other aesthetic treatments such as laser/IPL, chemical peels or microdermabrasion. Following treatment it is recommended that an ice pack or cooling device is applied to the treated area to decrease the immediate redness caused by the injections. The wearing of make-up should be avoided for 12 hours following injection. Sun block should be applied or exposure to the sun avoided. Saunas and steam baths should be avoided for a period of 10 days post treatment. According to the manufacturers Varioderm™ is expected to last between 6 to 16 months depending on the area treated and the specific product used. 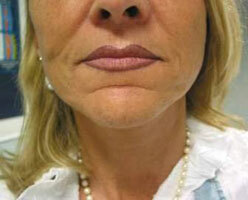 This is due to the high degree of cross-linking which makes resorption by the body slower than with other HA products. Transient erythema (redness), swelling, possible discomfort at the implant site, this usually resolves in a few days. Any persistent reaction must be reported to your practitioner. This depends on area treated, the particular product or products used from within the Varioderm™ range to achieve the desired result, and how much is required, as well as the practitioner doing the treatment, but price ranges are in the region of £200 per treatment (2 pack of syringes) of Varioderm™ Fine Line, £250 for Varioderm™, £275 for Varioderm™ Plus and £300 for Varioderm™ Subdermal. 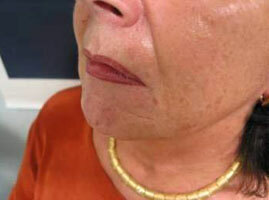 Before (left) and After (right) showing a combination use of Varioderm™ Subdermal and Varioderm™ for the treatment of nasolabial folds and cheeks after 9 months. 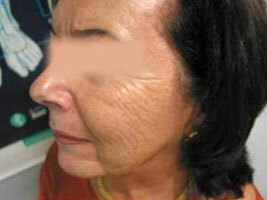 Before (left) and After (right) showing the treatment of nasolabial folds and marionette lines with Varioderm™ and the treatment of the cheek surface with Varioderm™ Fine Line after 4 months. 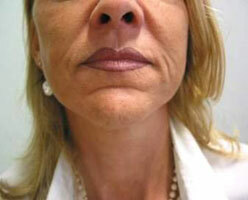 Photographs courtesy of Dr Weidmann and Medical Aesthetic Group. Click for ALL Varioderm™ clinics in the UK & Ireland registered and verified by Consulting Room. 4 out of 5 based on 6 customer reviews.